Cousins Holden and Jack were baptised last Sunday at St Austin by Father Steve who made the ceremony festive with his good humor. Holden was happy as ever, dancing to the organ music and singing out during mass. He managed to stay in good spirits even though he had a stomach bug and subsequent poo-tastraphe in the middle of the mass. I cleaned him up the best I could and wrapped a blanket around his soaked overalls. He stunk to high heavan but luckily his godmother Michelle was gracious enough to hold him anyway and he slept peacefully through the entire baptism ceremony like a cherub, only stirring a bit at the second dousing of holy water. We were happy to get him home and in the bath, a quick change and then a fun celebration for the newly baptised boys at our home. We are delighted to have the honor to be baby Jack's godparents and glad that our boys were able to share this special day. Baby Holden and GG at the begining of mass. Baby Holden waving 'Hi' - one of his newer talents. Holden with his godmother Michelle and GG with Lily. Our big boys with Grammy and Papa. Will absorbed with his trains on the church steps. Baby Jack with parents Tia Christy and Chris and paternal grandparents Mary and John. Holden's godparents Stuart and Michelle. Yesterday it was in the high 70's, last night a cold front blew in and we have a bit of snow. 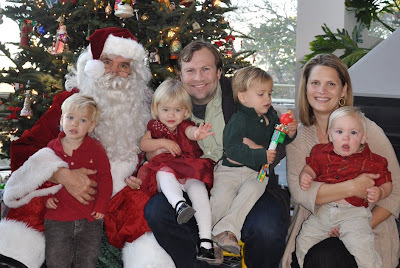 Our friends Renee and Ned hosted a party with Santa this weekend. Yesterday was my last day at Dell. They offered voluntary separation packages so that they can hopefully avoid layoffs. It ended up being the nudge I needed to leave work and stay at home with the kids. Before it was just too difficult for me to give up a part time position with a good salary and benefits. I was only in the office three days so I could still be home with the kids most of the week. It felt like a good compromise. But with the offer of almost a half a year pay it tipped the scales to staying home full time. It feels like good timing now that the 'big kids' are two. They are needing more individual attention and new activities. Being home will allow me to get them out of the house more for trips to the zoo or nature center. We will be able to do some more activities like swimming classes. And I'll be able to get a better handle on our home routines, like meal planning or seemingly simple stuff like getting the day started. I'm keeping Carmen. I need her right now so that we can get out of the house and so I can spend the individual time with my kids that I have been craving. It is a big transition. It feels good to close that chapter of my life and look to what is next. This past week I was able to reflect on my six years of work then let go of all those old work files and emails. I feel lighter. Someday I do want to work again but taking some time away will help me figure out what I really want to do and in the meantime spend some meaningful time with my children.